The first Catholics in Greenfield celebrated Mass in their homes whenever a priest was available. In 1860, a frame structure in the 100 block of west North Street was purchased. 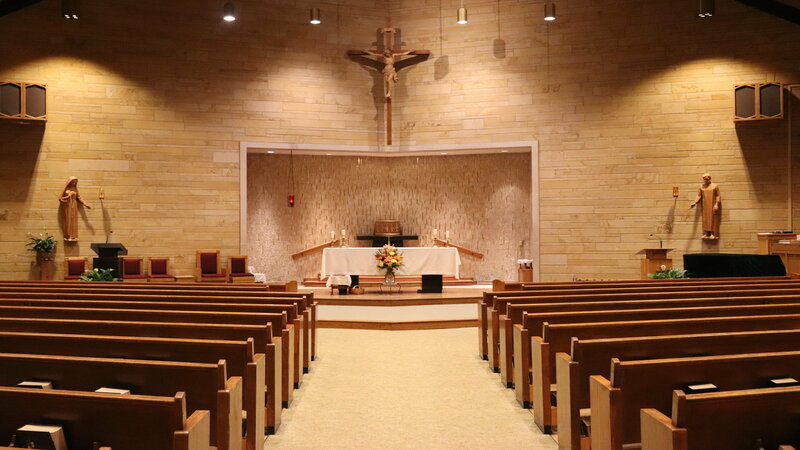 The church was organized and became known as St. Michael Roman Catholic Church. The pastor of St. John’s Cathedral in Indianapolis exercised control of the parish until 1876. The care of the parish was turned over to the Franciscan Fathers of Sacred Heart in Indianapolis until 1934. In early 1897, Father Zacharias appointed a Building Committee and plans were drawn for a new brick church. The first Mass in the new church was held on February 27, 1898. A special train brought Catholics from Indianapolis to attend. The building still stands today on North Street. During this time, Mass was only celebrated twice a month. As the roads improved, Mass would be celebrated every Sunday after which a parishioner would then drive the priest to St. Thomas in Fortville for their Mass. In 1934, Fr. John Riedinger (1934-1938) was sent as our first resident pastor. The home next to the church was purchased as a rectory. Father John also cared for St. Thomas in Fortville. Fr. Dennis Spalding (1938-1947) was a very outgoing, community minded priest. He could be found at the golf course or hunting with his dog every chance he could. By 1947, the parish had grown to 95 families and welcomed the arrival of Fr. Daniel Nolan (1947-1973). A reserved, dignified and scholarly man, Fr. Daniel would become the longest serving pastor at St Michael. By 1952, the parish had outgrown the church and plans were drawn up for a new church and school combined. After much deliberation, a site consisting of 10.5 acres on the northwest edge of Greenfield was chosen. At the time it was just a cornfield with a few homes south of it. The new stone building was dedicated in the spring of 1954, and the first Mass was celebrated on Thanksgiving of that year. The two story building had three classrooms. Father’s office and restrooms were on the top floor and the Chapel and cafeteria in the basement. Enrollment in the school was 107 students. Sister Rose Angele Spalding (Fr. Dennis Spalding’s Sister) was the Superior and Sister Ann Raymond and Sister Dorothy were the other teachers. Two houses across the street were purchased for use as a rectory and convent for the Sisters of Providence, who were to teach in the school. In 1961, Fr. Daniel celebrated his 25th anniversary in the priesthood. The parish celebrated with a Mass (with the ushers wearing tuxedos), a family luncheon and an open-house reception. The school children celebrated his jubilee by presenting Father with a set of new vestments. By 1965, the parish had grown to 234 families. The chapel was crowded at all three Masses and the classrooms were bulging with 189 children. Fr. Daniel and the Finance Committee decided to build a new church which was financed by the regular Sunday collections. Ground was broken that spring with the cornerstone laid on November 28, 1965. The first Mass was celebrated on June 26, 1966. On August 20, 1972, the parish celebrated Fr. Daniel’s 25th anniversary as St. Michael’s pastor. Fr. Daniel would be with St. Michel for one more year. In 1973, Fr. Joseph J. Riedman became our next pastor. He had been resident instructor at Scecina High School in Indianapolis. Father “JJ”, as he was lovingly called, was little but mighty. He endeared himself to all he came in contact with. He was a carpenter, electrician, plumber, math tutor, “soothsayer-soul saver”, and friend. Father was active in the community. He even served as President of the Greenfield Ministerial Association. Father initiated the use of Eucharistic Ministers and Gift Bearers as outlined with Vatican II directives. The parish was growing and in need of more space for meetings, socials, etc. On September 10, 1978, the parish Activity Center was dedicated and named Nolan Hall. Also during this time, the parking area behind the church was added, security lights were installed and the choir area in the back of the church was enclosed to become the parish office. In July of 1980, Father Stephen J. Banet (1980-1989) became our new pastor. This dynamic, personable and witty young priest, gave much detail to each liturgical event. Alter decorations, vestments, music, all took on a beautiful blend to enhance the event being celebrated. Father Steve initiated RCIA (Rite of Christian Initiation for Adults), confirmation classes, baptismal classes and marriage sponsoring couple classes. The parish was continuing to grow and the parish office in the church was inadequate. A mobile home was purchased and placed near the parish activity center. In 1985, the Reconciliation Room was created from the old crying room was moved to the old parish office space. An Administrative Annex was added onto the activity center in 1986. Many other improvements were completed at the school as well as the church. Father Stanley J. Heber (1989-1995) was our next pastor. His sister, Sister Marylyn Heber taught at St Michael School from 1962 to 1965. At that time she was known as Sister Vincent Marie. She taught 46 students in the sixth, seventh and eighth grades, all in one room. For a few years, Father Robert E. Mazzola (1995-1998) was with us. December 1998, Fr Severin Messick. O.S.B. (1998-2011) became our pastor. Fr Severin was a Benedictine Monk before becoming a priest. He took many parishioners and students down to St. Meinard on retreats and tours. Many new things occurred during Fr. Severin’s time here at St. Michael. In 2001, shrines were dedicated to the Holy Family and St. Michael. Our Knights of Columbus, St. John Newman Council gifted a beautiful crucifix and purchased a memorial stone to recognize the aborted babies. Finally a new rectory was built that would be able to house two priest. In 2004, the parish life center which included a gym, meeting rooms and a new school office was built. It would later be renamed the Fr. Severin Parish Life Center to honor our beloved pastor who was taken from us too early. In honor of Fr. Severin’s anniversary as a monk, money was donated and a gorgeous stained glass window of St. Michael was dedicated in January 2006, by Archabbot Lambert Reilly, O.S.B. On June 28, 2008, Deacon Wayne Davis was ordinated to the Order of Deacon by The Most Reverend Daniel M. Buechlein, O.S.B., Archbishop of Indianapolis. St. Michael parish celebrated this event with a Mass of Thanksgiving and a reception following in honor of Deacon Wayne. St. Michael parish is blessed to have such a dedicated man as our deacon. On September 28, 2011, Father Severin Messick, O.S.B., passed away. Fr. J. Nicholas Dant served at temporary administrator until the arrival of Msgr. William Stumpf, PhD, (2012-2014). Fr. Bill was just wanted St. Michael parish needed after the death of Fr. Severin. Fr. Bill was appointed to Vicar General and Moderator of the Curia of the Archdiocese of Indianapolis and began his duties officially on January 1, 2015. As St. Michael waited for the appointment of our new pastor, Father Joseph L. Newton, JCL, BA, MDiv, served as parish Sacramental Minister while Deacon Wayne Davis was appointed Parish Life Coordinator. On July 1, 2015, Father Aaron M. Jenkins, MDiv, became our pastor.